If you haven’t done so already, catch the much anticipated Prometheus this weekend! 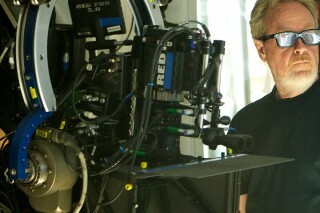 Director Ridley Scott on set with the RED EPIC cameras. You’ll see the skills of Identity Stereoscopic/VFX Supervisor, Leo Vezzali, and his 50+ hours of stereo optimization on this film. Both Mistika and Ocular were vital tools in the 3D stereo optimization process.